1966　Manabu Suehiro was born in Osaka. 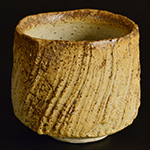 1985　Studied under Togaku Mori, and joined the first firing at Sabukaze Ogama (a great Sabukaze kiln project conducted by Togaku Mori and his fellows). 1997　Has been holding solo exhibitions since then. 2004　Won an award at the Chano-yu (Tea Ceremony) Exhibition at the Tanabe Museum of Art, and also in 2005. 2008　Participated New Sabukaze Ogama kiln of his master Mori Togaku.